Carpet Remnants Always Low Price. Go to the individual pages to see details. 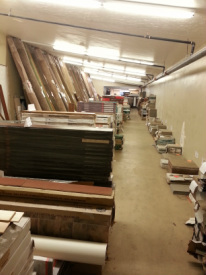 Laminate Small Quantities Starting price $0.50/sf stock only. Prices marked. Remnant Hardwood Starting at $.99sf Limited Quantities. Tile $0.25ea Price is only for 3 boxes and less that we have left in stock. Adding to the sale often. We have many things on sale and in the bone yard. Come and see our deals. Priced to sale. All Sales are finial no returns.